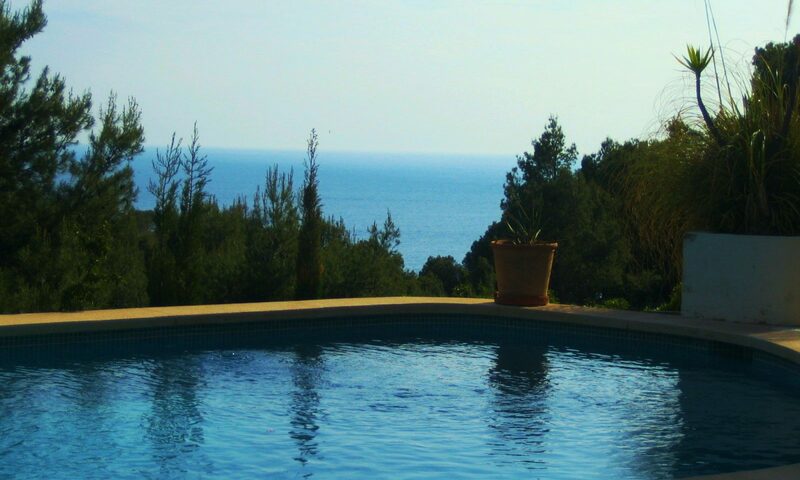 The elegant furnished villa „Casa Helia“ is a holiday home in Port d’Andratx and located in a quite district of Cala Llamp bay. It holds space for eight people and offers a great view onto the sea and La Mola that you can enjoy on your patio. This beautiful holiday apartment is located in a resort with three houses in Cala Llamp – Cala Marmacen. The house offers an ideal holiday atmosphere with its 185m² living space, additional 70m² patio that features a barbecue place and a roof terrace with a summer kitchen. A big pool outside with a great sea view and a nice, manicured garden belong to the resort as well. There even is a garage at your disposal. It is an approx. 30 km way to the capital Palma de Mallorca and to the airport. This semidetached house is situated in a small residence (only 3 houses) on Port d“Andratx (Cala Llamp/Cala Marmacen) with a dream view of the sea and the Mola Island. This smal Villa offers a total of 185 m² living area plus 70 m² terrace with barbecue. First floor we find living dining-room with fire place, fully fitted open kitchen, guest toilet and a storage room. On the upper floor are 4 bedrooms and 2 bath and a office (or bedroom 5). The house has a private garage and parking possibility and also a large community swimming pool and a nice garden house. Casa Helia was built in 1990 on a steep slope and is located on a quiet side-street at Cala Llamp bay in Puerto de Anratx. You just have to follow the street down to the sea and you will find yourself in one of Mallorcas most beautiful bays. Casa Helia is an especially luxurious holiday apartment in a top location. It fulfils even highest pretensions and is season independent due to central heating. The exclusive beach-club Gran Folies (www.granfolies.com) is only a few minutes away. The villa holds space for eight people and offers a great view onto the sea and La Mola that you can enjoy on your patio. Upper floor you find a big living room with a fireplace and dining-space, open american kitchen, guest toilet and storeroom. 2 bathrooms and another kitchenette. A big pool outside with a great sea view and a nice, manicured garden belong to the resort as well. There even is a garage at your disposal. For end-of-stay cleaning, use of bed linen and towels we charge a fixed rate of 175,– EUR. It’s required to post a bail about 125,00 EUR in cash. For stays longer than 2 weeks, please contact us for prices.